Mono versions of FX Plugins? I created a 1 channel version of the HISE plugin... the exported AAX shows up as a mono plug in Protools! Great news. Does it work in Logic (or whatever DAW was also not working correctly)? @orange Can you try this with your rig and let me know if it works? @dustbro How did you compile 1 channel version of Hise? Only from JUCE interface or did you modify any code? @dustbro Ok, so after compiling it, in HISE, you made the routing of the master container 1 to 1, that's it right? @Christoph-Hart I think the only reason for this mono plugin problem is; there is a misunderstanding for that. Stereo plugins shouldn't be at the same time mono compatible. HISE trying to make a stereo plugin mono compatible. Maybe that's why it is hard to do it. 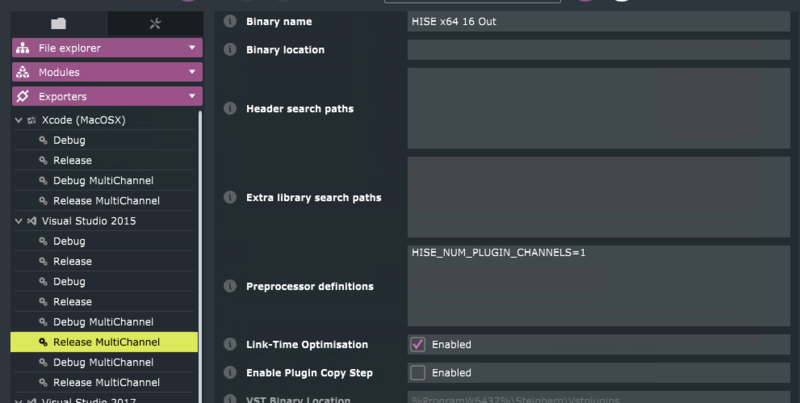 For mono plugins, HISE should create a different mono channel plugin, that uses only one channel (1 in - 1 out) like @dustbro had manually compiled HISE. All of the fx plugin companies are making separted mono VST2, AU, AAX plugins with stereo versions. In only VST3, an fx plugin is able to compatible with mono tracks at the same time, but in VST2, AU and AAX mono version should be compiled individually. So maybe HISE can compile a stereo plugin with only one channel and create a seperate plugin with stereo version. Just simulating like @dustbro manually did. So all of the versions will be double (mono & stereo) is it possible?